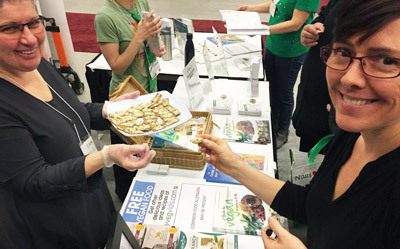 Montreal Vegetarian Society (MVA) reached 8,000 event attendees with their vegan food samples at a large, popular food and lifestyle expo in Quebec, Canada. The Expo Mangé Santé et Vivre Vert is a three-day event that attracted 35,000 people in 2017. The Expo’s mission is to promote the importance of the quality of food and lifestyle for our health and the environment. Vendors and experts participated from a diverse range of influential industries, including biological farming, ecology, fitness, and well-being. The event strongly emphasizes local and organic plant-based produce and foods. Montreal Vegetarian Society volunteers did a wonderful job of reaching out to the Expo crowds with vegan food samples and educational literature, showcasing some of the excellent plant-based products available in the local area and engaging with people interested in learning more about the benefits of a vegan lifestyle. A team of 40 volunteer vegan activists worked shifts across this three-day event, preparing and distributing vegan food samples and educational literature. This free vegan food giveaway sparked engaging discussions with attendees who stopped by the organization’s booth. MVA’s booth was professional and in keeping with the event’s overall standards. Vegan food samples and educational literature were displayed neatly, and the activists used branded materials (tablecloth and slide banners) to ensure that their setup provided passersby with an insight into the organization’s mission. Presentation is important in the impressions we convey to the public as vegan advocates. 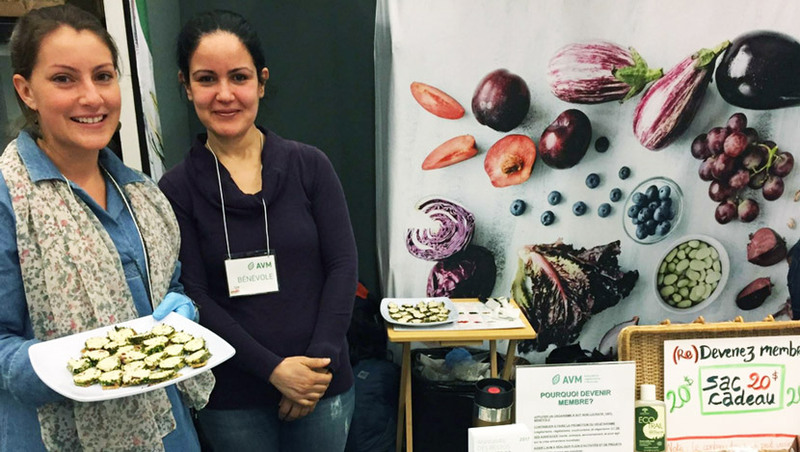 The organizers opted for high-quality, locally produced brands of plant-based cheese to match the interests of the audience attending this event, which focused on organic and locally produced food. Approximately 8,000 of the 35,000 event attendees stopped by MVA’s booth to find out more about plant-based lifestyles. Many had never tried vegan cheese before so this was an opportunity to introduce them with high-quality, locally produced vegan brands. The food sampling sparked engaging conversations with event attendees, and the activists were so inspired and motivated by the responses received that many of them opted to do extra shifts over the course of the weekend! Food sampling at large events such this are great opportunities small, local companies to raise brand awareness. Often, these companies will happily provide activists with food donations, which, with a bit of planning and arranging, can lead to a good stash of samples at minimal cost to give away at your event. Don’t be afraid to reach out and ask! Ready to apply for a Food Sampling grant?